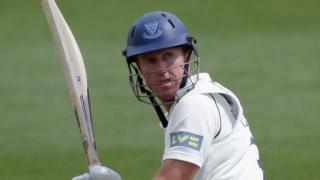 Sussex veteran batsman Murray Goodwin was given a standing ovation after being dismissed for 77 in his final innings for the county at Hove against Somerset. Goodwin was caught behind off Alfonso Thomas and was accompanied off the pitch by his children as he made his way to the pavilion. Earlier this week, Zimbabwean Goodwin, 39, announced his exit from the south coast club where he has scored 48 first-class centuries over 12 seasons and set a county record of 344 not out, against Somerset, in 2009.